Leyland's Steven Pallett achieved a Northern League milestone at the weekend when he collected his 500th League wicket in the second division victory over Carnforth. It was fitting that Steve achieved the feat at Fox Lane where he has been a much respected player for over 20 years. Following in his father John's footsteps Steve made his Leyland 2nd XI debut in 1987 and his first team bow in 1990. A one club man Steve's nagging accuracy and pace generated from the best of tracks made him a highly respected opening bowler. He achieved his best season in 1998 when he took 50 wickets for Leyland's first team. 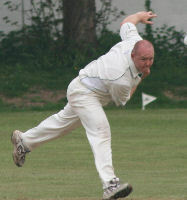 In total he has bowled around 3,600 overs for the club and taken 393 First XI wickets at an average of 23.25. His 108 Second XI wickets have been taken at a shade over 18. Leyland captain David Makinson led the tributes. "Steve's been a great servant to Leyland CC for many years," Makinson said. "When we played at Leyland Motors he was always one of the opponents we feared the most when playing in the derby games. As well as being a great competitor and fine bowler, he is also a tremendous fielder and a more than capable batsman who should probably have scored more runs. "His attitude since the merging of the clubs, both on and off the field, has been first class, helping him become one of the most popular players in the club. "Compared to some, he's still a young man. I'm sure there are many more performances to come yet"